Warning: stop reading if you're easily frightened, and if you're not a Stranger Things fan. Thank you. To celebrate the release of the highly anticipated second series of Netflix's original drama series, Stranger Things, the company has launched a chilling Stranger Things Snapchat 3D World Lens and filter. If the show has not been scary enough for you, the augmented experience lets you "walk" around Joyce's living room and let blood drip from your nose when you point the camera to your face (the face lens is available in the US and Canada). 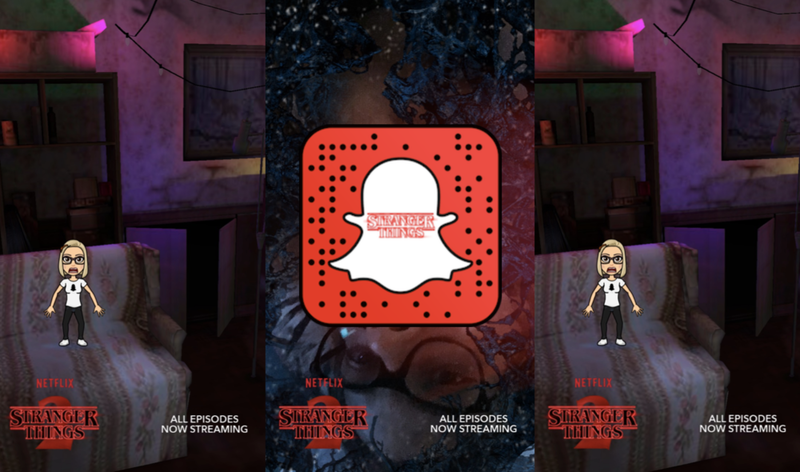 When using the Stranger Things Snapchat 3D World Lens, you can tap different elements of the room, such as the floral wallpaper, striped couch, painted alphabets and colored fairy lights, and discover and interact Stranger Things' easter eggs, with the show's scary song playing in the background. Unlike other world lenses you might have experienced, Stranger Things Snapchat world lens doesn't simply augment your reality but lets you "walk into" the Stranger Things space. That is, you won't see the real-life objects you're pointing at and your reality will be fully replaced with the show's experience. Outside of Snapchat, Netflix partnered with a riding company Lyft in Philadelphia and Los Angeles offering users an immersive "Stranger Things" ride with scary lights and sounds, when they book a car in the “Strange Mode” on the app. Found some cool easter eggs in the Stranger Things Snapchat lens? Tweet them at us at @innavation for a chance to get featured on SnapchatDaily.com and in Snapchat in @innavation's account.